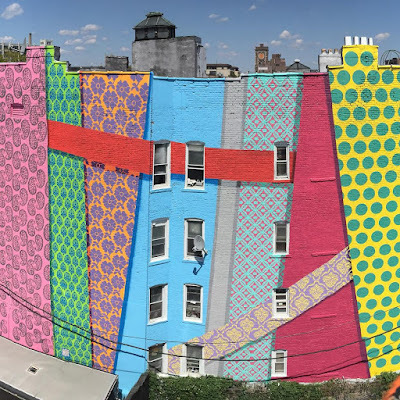 As part of Jersey City, New Jersey's "Mural Program" which instills adornment of less sightly urban walls, I stumbled on "Jaan Pechechaan Ho". This colorful, obviously "saree" inspired mural call itself "inspired by Indian blockprints and textiles" via Hellbent's (artist) website. I pleasantly surprised by the "saree mural" as it reminded me of long sarees drying on the sides of buildings in a quintessential Indian city. Conceptually the title, "Jaan Pechachaan Ho" makes sense as this translates to, "May there be familiarity". The mural's home is in the Journal Square neighborhood of Jersey City, home to "India Square", which according the Wikipedia, is home to the highest concentration of Asian Indians in the Western Hemisphere. It just so happens to be the title track of of the 1965 Bollywood movie Gumnaam (video below). The song recently regained popularity, thanks to the work of Wieden + Kennedy (advertising firm) when they utilized the track for a surreal Heineken commercial. 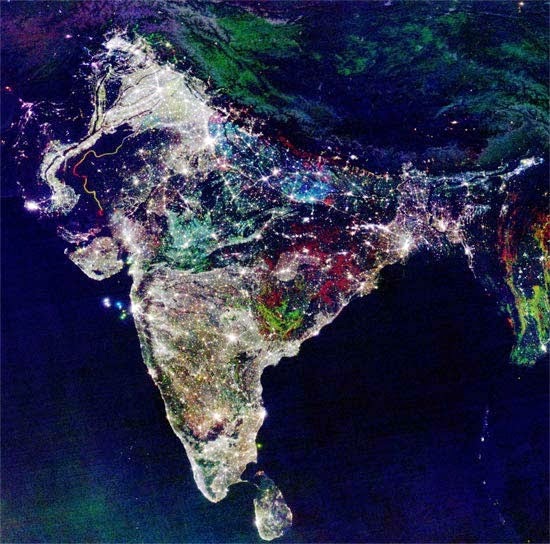 This upbeat song could be the sound track of "India Square". The crowds, organized chaos and bustle are akin to this upbeat song. It doesn't appear that Hellbent is Desi by origin but I do appreciate the adornment and overall concept. When it comes to familiarity, "India Square" will not allow you to be mistaken that you are in an Indian neighborhood. However, amongst the chaotic commerce and sprinkle of Hindu temples there is a clear lack of art. Let's hope that the mural inspires additional projects like this. There must be some Desi artists with a penchant for urban art that wants to further this effort. As of recent, Jersey City has been experiencing aggressive gentrification. 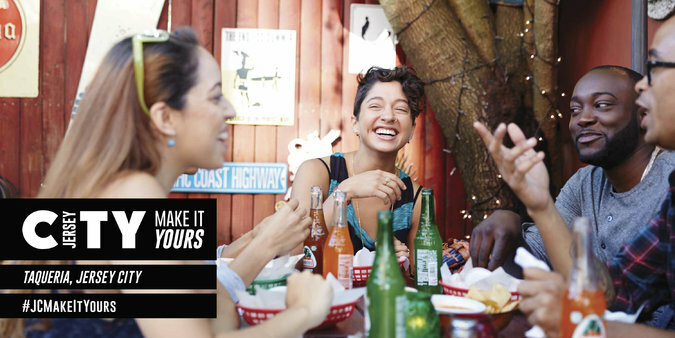 The "Jersey City Economic Development Corporation" had launched a $1.2 million dollar, "Make it Yours" campaign to attract millennials from NYC in 2014. The issue that I found with this campaign was the lack of "Desi" origin presence. Could it be that the "Jersey City Economic Development Corporation" wanted to hide the fact that Desi presence is all over Jersey City? Demographically it is difficult to walk the streets of Jersey City and not find a Desi. 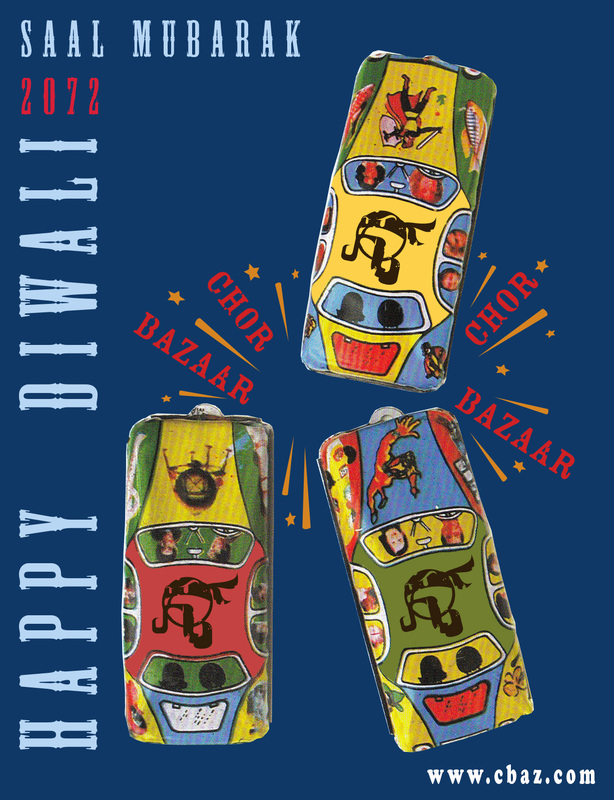 Perhaps Desi folks are not generally hipster-millennial enough to adorn one of their posters? Or dare I say it, cool enough? Sure most of the Desis work in the technology industries and tend to shy away from smoking their own meats and brewing their own artisan craft beers but WTF? Jersey City cannot hide the fact that "India Square" exists in the center of the city itself. 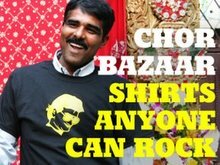 All the more reason for Desi artists to step up against this shallow minded campaign and it's backers like Mayor Fulop and show that we exist. Go out and create. As a "brown" person walking down a busy city street it can be startling to witness white folks with a mark on their forehead. I use the term "white" folks in lieu of Caucasians because technically, some "brown" folks are Caucasian (look it up). Let me digress...Brown folks are the bearer of marks on their forehead, not white people! 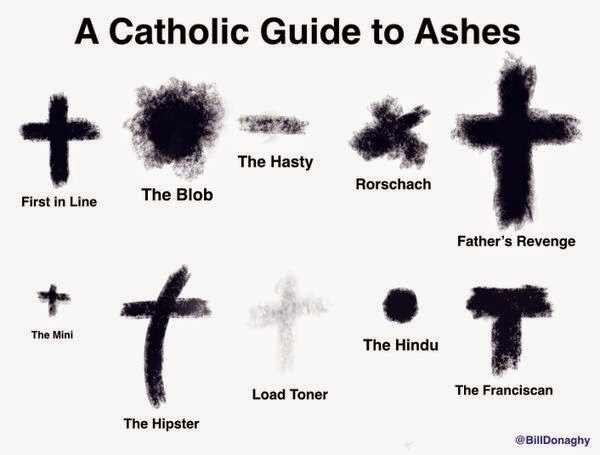 I stumbled upon the image above, "A Catholic Guide to Ashes" which is credited to @BillDonaghy via Twitter. Take a look at the bottom row, second from the right. Yup, "The Hindu"! Wait a second, you can't steal the Bindi and make it Catholic, that's just not copacetic. I want Ash Wednesday to be completely Catholic, with no relation to being a Hindu. I need Ash Wednesday's as an example for every time some ignorant person inquires about the "Dot" (aka Bindi) and it's significance. We'll let our audience be the judge on this subject. Looks like social media marketing is taking over the 27 feet x 4 feet of cloth, otherwise know as the Sari. 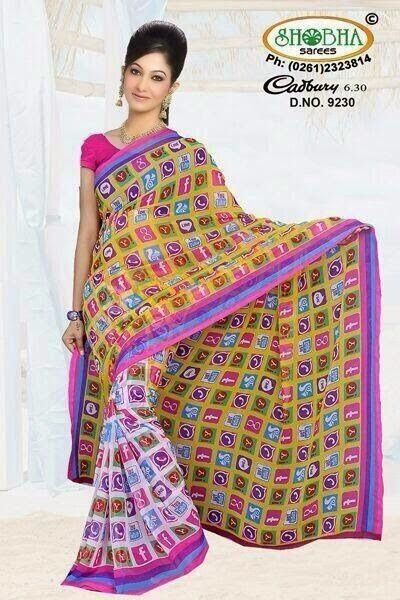 Why anyone would want to openly display their love for Facebook and Whatsap on a Sari, which by the way dates back the Indus Valley Civilization (2800–1800 BC), makes us scratch our heads. Perhaps it's a ploy to segue ones compliment on the Sari to show off one's new smart phone? People in India love their phones and often make sure to show them off, especially if the case is encrusted with Swarovski crystals. Call it "bling" if you wish but it is more of a status symbol. Another thought, is perhaps these ladies are tired of being asked if they use social media platforms. "Really?, can't you see my Sari?" 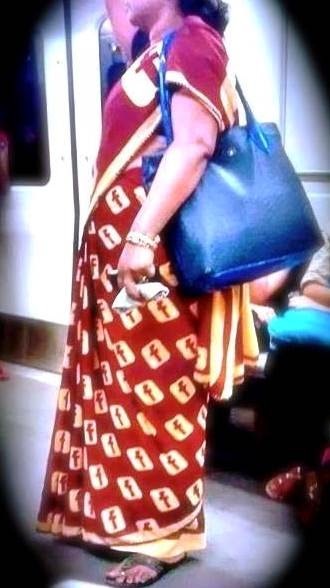 Something tells us that Facebook did not authorize the use of their logo on this Sari especially given the color. We bet that the manufacturer will probably laugh off the cease and desist order once Facebook finds them. 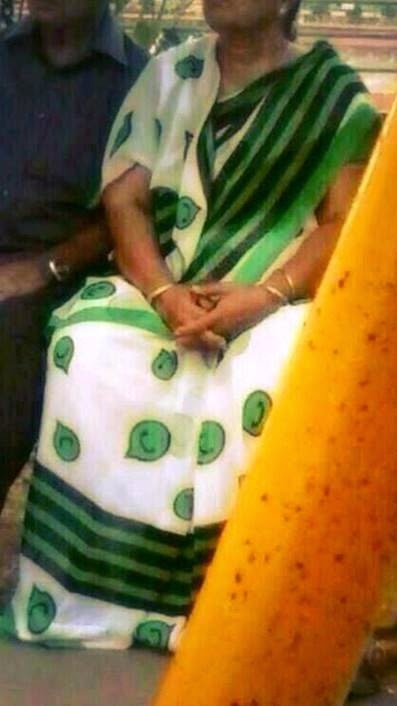 Well this manufacturer gets an "A" for effort on staying true to Whatsap's colors. Oh my! She certainly knows her social media, no messing with her! We will continue to search for the enterprising aunty who is solely rocking a LinkedIn Sari, stay tuned.